Toruń (Thorn), around 1645, Muzeum Okręgowe w Toruniu (District Museum of Toruń). 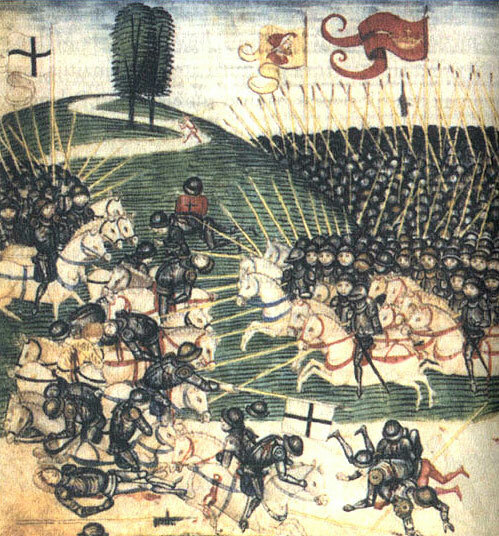 Lead a Polish army of 20,000 men through Koziebrody in 1410. Transfiguration of the Lord Orthodox Church, Plock, 1863, by the architect Józef Górski who designed Sw. Jakuba in Koziebrody. 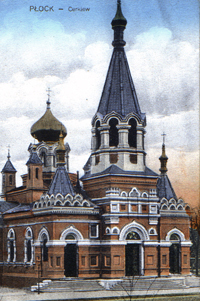 The Architect Stephan Szyller who designed improvements to Sw. Jakuba churchin 1902 and 1909. 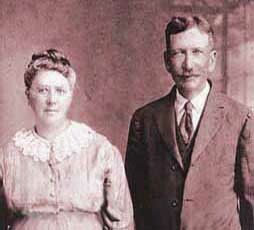 Antoni Kuźniewski & Michelina Sadowski-Kuźniewski, c. 1910, after leaving Koziebrody Parish. 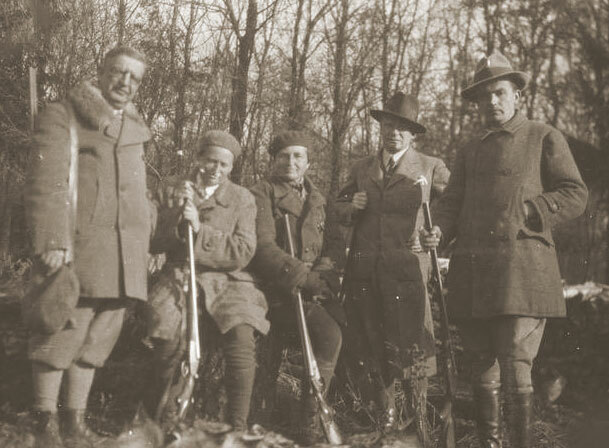 Noble Hunt: Count Wolanski, Countess Arnold, Countess Baworowska, Count Felix Koziebrodzki (1871-1931) and Count Goluchowski. Circa 1930, Serock, Poland. The Kuzniewski (Kneski) family is from the Mazovian Parish (Parifia) of Koziebrody, as was mentioned in the previous section. 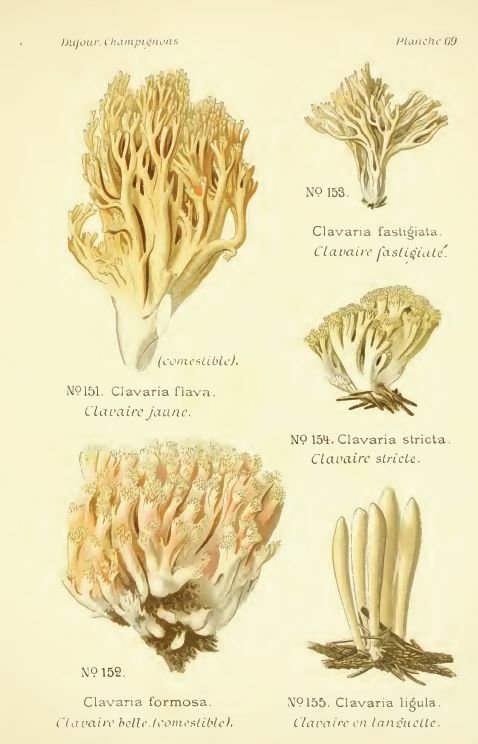 The Parish of Koziebrody was probably given its name due to an abundance of edible mushrooms in the local forests called "goat beard," or, "grzyby kozie brody" in Polish (species Ramaria flava). Other sources say that it is named afetr the clumps of grass in the surrounding pastures also called "goat beards." We will go with the mushrooms until proven otherwise. Today the area is still known for its highly valued wild mushrooms, primarily Boletus edulis - known in the Americas and Italy as "porcini" and in Poland as "borowiki," meaning "pine-lover" - which are harvested from the local forests by hand, as they can not be cultivated, unlike fresh supermarket mushrooms. This is why they are often dried before being sold, either locally, or through export. Borowiki are the most highly regarded edible Polish mushroom and can be found throughout Poland. Borowiki are a key ingredient of Polish Bigos (Hunters' stew), mushroom pierogi, and an essential part of the Polish Christmas Eve meal, called Wigilia. At one time, Koziebrody, and the surrounding villages, belonged to the noble families that either inherited, or were granted the lands by the local royals, the Dukes of Mazovia, through what was called a "privilege." The nobles could then bequeath or sell these lands to other nobles. The noble family that owned Koziebrody originally, all the way up until the 1800s - some 400 years later - was called Bolesta. Later, the family was called Koziebrodzki (crest above on left), as in the "Counts of Koziebrodzki," with the name obviously being taken from the name of the village central to the area they owned. The Koziebrodzkis were followed by other noble inheritors, and noble purchasers, as the owners of Koziebrody, until WWII, by which time the institution of "noble lands" became obsolete under communism. Prince Ziemowita granted a privilege in the year 1408 to the family Bolesta, as they recount, stating that there must (henceforth) lie in the family crest, towards the top, a horseshoe bar. One branch is from the the District of Kuchary... Bolesta of Koziebród (Koziebrody) and Nicholas of Kuchar, friars, the sons, it appears, of Bartholomew Bolesta who was made a judge of Płock in 1363 and erected a church in 1373 in Koziebrody. Bartholomew and Paul Koziebród, listed in the privilege of Prince Ziemowita of 1408 conferring the Bolesta's noble title... were apparently the sons of the Bolesta mentioned in 1373. Bartholomew, was the inheritor of Gołkow, in the area of Warsaw (15 miles south), which he received "under German law" in 1422. His son was likely Andrew of Koziebród, the heir to Gołkow, who married Catherine of Mniszew, and became the cupbearer to Prince Ladislaus Mazowiecki in 1437, in Karsy (northeast of Drobin). As Andrew of Karsy, in 1458 he became "podsędkiem" and "earthly judge" in Plock in 1475. The Jastrzębiec clan comes from Karsy. There was a Jan Koziebrodzki z Koziebród (1410-1493) that was a Kastellan of Raciaz - presiding over all of greater Koziebrody - in the 1430s (see list below). The Koziebrodzkis built "a palace" in a large clearing of land just northeast of Koziebrody that stood there until it was replaced by a wooden house after their departure. It is said of the Koziebrodzki palace that "many guests were coming for diversion and hunting. After a successful hunt, the nobility rode in hunting clothes to Drobin with devotion to thank God." Notably also, Marcin Bolesta-Koziebrodzki (1720-1787) obtained the title of "Count of Galicia" from Emperor Josef II in 1781; so it seems as though they were a family that was gaining power in Poland. Marcin owned Koziebrody and Laszewo, was a Castellan, an Appellate Counsel in Lwów in Galicia, and the Treasurer of Kiev. The next hereditary noble owners of the village of Koziebrody - by 1817 - were Michała Żurawski, Ludwika Lempicki, and Walentego Małowieski. By 1850, the three separate fields of Koziebrody owned by these three nobles were joined together under one new owner, Stanislaus Turowski. In the final chapter of the nobility of Koziebrody, the noble de Thun family took possession of Koziebrody in 1887, after purchasing the land from Turowski. They lived in a wooden house built on the site of the old Koziebrodzki palace just northeast of Koziebrody which burned down on August 4th of 1963. The de Thun Estate buildings, along with the manor and "czworakami" (farm building with four separarate living quarters), burned during the terrible fire which destroyed most of the village and nearly burned down the church. The founder of the Polish branch of the de Thun family was Karl Ferdinand de Thun. According to the Gotajski Almanac of 1907, he was born in Racibórz on June 17, 1786, was captain of the King of Denmark, and came to Warsaw with Napoleon. There he met the daughter of a pharmacist from Prague named Maria Luiza Stern (born 1796), and after marriage settled in the meadowlands at the Jezewo Parish in Radzymin, close to Koziebrody. He was a knight of the French "Order Pour le Merite." The property at Jezewo was owned by Charles de Thun of the Silesian branch of the family. Karl did not live long, but he managed to have ten children, including four boys, one of whom died at the age of ten and is buried in the parish cemetery in Radzymin (the tombstone is a stone grasshopper). The other three sons launched the three Polish lines of de Thun, which are now all extinct. The ninth child, Jan Emilian de Thun (1821-1896) appears to be the first De Thun owner of the Parish of Koziebrody that actually lived there. He participated in the 1848 insurgent movement in the Polish western territories and was buried in the parish cemetery in Koziebrody. His children were Stanisław (died as a child), Wincenty, and Ignatius, who are both buried in Koziebrody. Until the Germans confiscated the land during the war, the entire village of Koziebrody was owned by Ignatius de Thun. His son, Wincenty de Thun, was born in Koziebrody in January of 1901, was a participant in the September 1939 campaign as a second lieutenant of the Polish light artillery reserve, and killed in Mauthausen-Gusen concentration camp in Austria in May of 1940. There is an excellent description of the De Thun's of Koziebrody, including detailed 20th century history by Dr. George Borowski from 2012. Koziebrody was protected under the Castellany of Raciaz; all of its Castellans (governers) are listed above (source: www.nobiles.republika.pl). A document dated 1478 which states: "In the year of our Lord 1478, the morrow of the fifth day of the week of the Division of the Apostles (July 15th) was magnificent, both in the presence of such good pedigree(s) of Christopher from the fields of the palatinate, Stephen from praiseworthy Plock, Cristian from Ossuchowo in the Duchy of Rawa, John of Koziebrody (see in the list above) in the Castellan of Raciaz..." The first written mention of Raciąż, however,can be found in 1095. The first archeological studies of ancient Raciaz, from the early 1800s, revealed traces of settlement from the tenth century. During these digs, the basement of a wooden fortification was revealed, being well preserved due to the moist soil there. The fort was situated on the river Raciążnicą and, fittingly, the main task of its inhabitants was guarding the river crossings. Stationed in the “castle” was a formidable company of men; but the less formidable castle itself was probably repeatedly rebuilt, being made of wood. In those days, the city was surrounded by villages that primarily provided various natural resources to Raciaz. That situation probably changed in the eleventh century, when more organized agriculture was developed in Mazovia, displacing many old growth forests. The final destruction of the fort in in Raciaz probably occurred in the 13th century; and, replacing the castle on Water Hill, was another wooden “castle” in the vicinity of the early medieval city. In the 13th century, the Castellany (the area protected by a castle) of Raciąz was amongst the most important in Mazovia. Within its borders lied forests, lakes, arable fields, and numerous settlements, including Koziebrody. Residents of the Castellan of Raciaz were responsible for defending the city, (up until the year 1454), and a regional judicial authority received the annual tribute. Also in the 13th century, fairs began to be held in Raciaz, into which drifted foreign merchants and local people. These fairs would have a significant impact on the town as it encouraged settlement in the surrounding areas. Various trades, such as weavers, attracted buyers, who were willing to travel to obtain quality canvas and cloth. An important branch of industry in Raciaz was the production of iron; perhaps the Kuzniewski’s obtained their surname of Kuźnia (forge) in connection with this new industry. 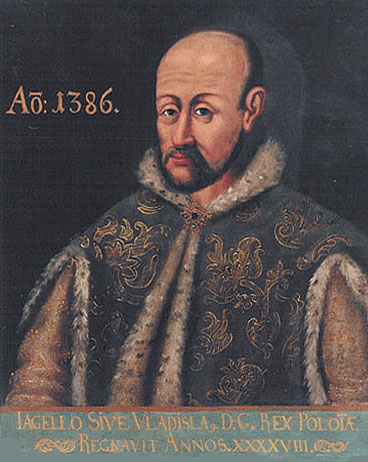 Raciaz was owned by the Duke of Mazovia, and, while remaining a Polish fiefdom, was attempting to establish their own international trade policies. Significantly, there is evidence that the local government controlled municipal trade before being granted municipal rights by the Duke of Mazovia.The second half of the 14th century began a period in which the city reached its greatest importance. The governments of the Dukes of Mazovia - Ziemowita III and Ziemowit IV - strove to maintain the separateness of the duchy from Poland proper, and the growth of its international position. The dukes tried not to take sides with any of the parties in the Polish-Teutonic conflict, and they may have even served as a kind of intermediary. That is why on May 22nd of 1404 there was a meeting in Raciaz lasting several days between the Polish King Wladyslaw Jagiello, agents of Vytautas, the Duke of Lithuania, and the Teutonic Order Grand Master Konrad Jungingen. At the conclusion of the meeting, a peace agreement was signed called the Peace of Raciaz, which was to reassure the Polish-Lithuanian-Teutonic geopolitical structure. The peace did not last long, and in 1410 the great war between Poland and the Teutonic Order began. Local legend has it that the Polish-Lithuanian forces from Tannenberg were deliberately marched by Raciąż in defiance toward her neutrality. There is also some disputed evidence that King Jagiello spent the night in the city. After the Polish victory at Grunwald the war ended. The next formal meeting of the warring parties took place in Raciaz in December of 1410, according to the historian John Dlugosz. From this information that we may acertain that Raciaz was significant in those years since it regularly staged the international meetings. One can not examine the history of Koziebrody without discussing the history of the Roman Catholic Church there as it is associated with most of the documented events over the past six centuries. Mazovia was Christianized in 966AD, and the first Bishop of the region, Agellotus, was installed in Płock in that same year. The original network of parishes in Mazovia was formed between the thirteenth and fifteenth century, and, with only minor changes, has survived to modern times. The organization of the Roman Catholic Church in Mazovia was formalized in the fifteenth century, being comprised of parishes of roughly 30 square miles in size. The Bishopric of Płock, and its "chapter," became the owner of this network of properties, the largest of which could be an entire "castellany" (Polish: Kasztelania) which would have been donated to the Church by a noble. Castellanies appeared during the Middle Ages; each being a district administered by a "castellan." The word is derived from "castle," and literally means the extent of land and jurisdiction belonging to a given castle (see map of Mazovian castles on the left). The church also had its own sources of actual revenue, which included "tithing." Every tenth sheaf (large bundle) of grain from the field was to go to the Church - this was called "tithe sheaves." The entire crop was not allowed to be brought in from the field before delivering the tithe sheath to the Church. People who did not pay the tithe could be charged with a "curse," including excommunication from the Church. 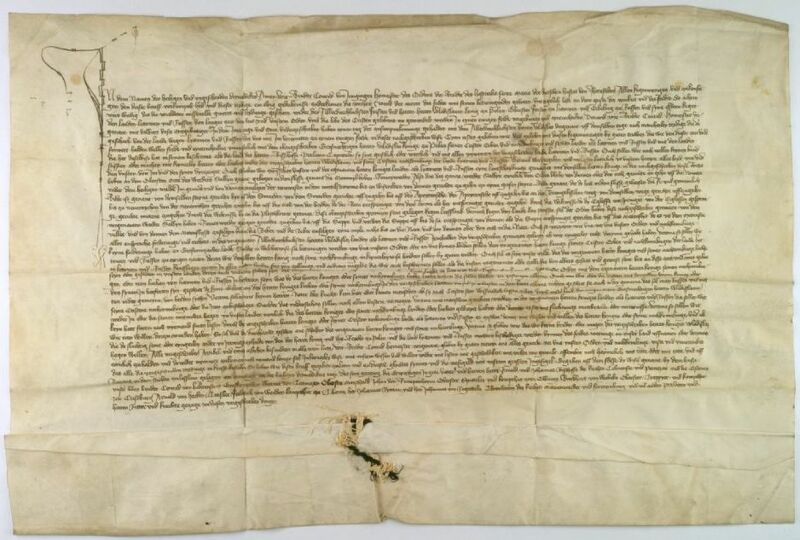 This penalty was applied by Dobiesław the Bishop of Płock, and the local farmers, against the hereditary owners of Żukowo, Koziebrody, Cieśle, and other places, as referred to in a document issued in 1381. The tithe could also be paid in money. 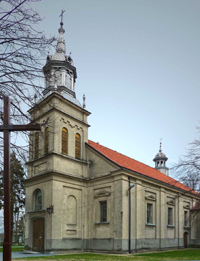 The Koziebrody Parish was founded on the 12th of July in the year 1373 by the friars James Bolesta of Koziebrody (Jakuba Bolesty z Koziebród), in the Canon of Płock, and by Nicholas of Kuchary (Mikołaj z Kucharów), a village three miles to the south of Koziebrody. The first actual official "church" was erected on July 16, 1376 by Bishop Dobiesław Sówka from Gulczewo (family crest above in center, the 32nd bishop of Płock, from 1375 to 1381); the brother of the two previous Bishops of Płock. It was said of Dobiesław Sówka that he was "a good shepherd and he paid all the debts of his brothers." He founded eleven parishes in the diocese, including Koziebrody, and is buried in the cathedral of Płock. The official Founding Act commissioning the church's construction has since disappeared, but a copy of the original existed as late as December of 1420, which read:"We have hereby commissioned the present document to be proof of our public faith in it from this day forward, and upon this resulting document we have placed our Greatest Seal this 12th day of July in the Year of our Lord 1373 in the City of Płock." The declaration for the creation of the new Parish of Koziebrody was by persuasion of the local Lord - a Bolesta no doubt, perhaps the Bartłomiej Bolesta-Koziebrodzki of Koziebrody cited below - who was motivated to do so due to the great distance and poor roads to the nearest parish which was in Drobin. More than likely, there already existed some structure that served as the court chapel in Koziebrody. The original church was plundered on July 5, 1410 by a Lithuanian army of roughly 12,000 under the command of Vytautas the Great - traveling, ironically, with a Polish army of roughly 20,000 under the command of Władysław II Jagiełło - passing through in full battle armor. 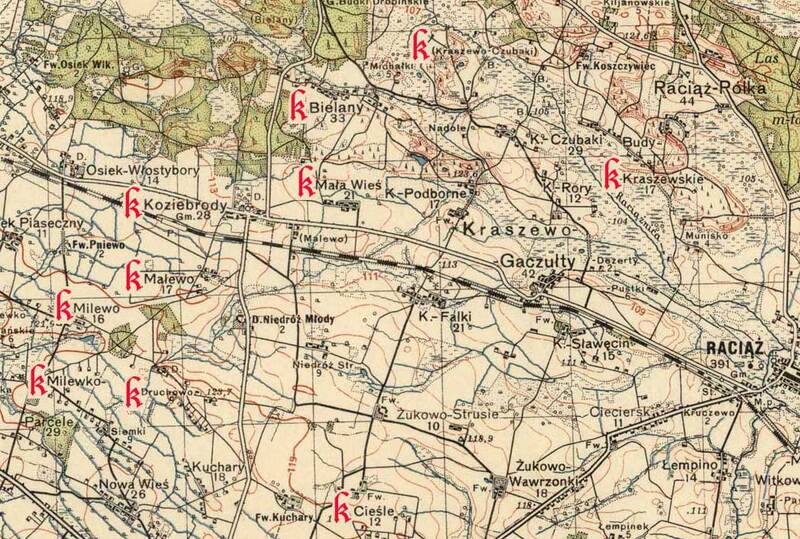 They were on a 20 mile trek from Żochowo Stare to the south of Koziebrody (where the army camped the nights of the 3rd and 4th) to Jeżewo-Wesel to the north on way to The Battle of Grunwald. The fact that Koziebrody was under the authority of the Castellan of Raciąz, which attempted to remain neutral in the ongoing conflict between Poland/Lithuania and the Order of the Teutonic Knights, and had in fact negotiated a settlement between the two authorities only six years earlier as a neutral agent, was no doubt a factor in the attack on Koziebrody. The battle of Grunwald, fought nine days later on July 15th, was one of the largest battles in Medieval Europe and is regarded as the most important victory in the history of Poland and Lithuania. The parish declined for ten years until the church was reconstructed and reconsecreated on December 13, 1420. In 1540 a new temple (22 x 10 meters or 72' x 32'; source: Diecezja Płocka, dz.cyt., s.339.) was erected dedicated to St. James, St. Lawrence and St. Dorothy, which was repeatedly repaired and survived until 1874. The parish at Koziebrody gradually declined, structurally, and demographically, between its first rebuilding 1420 and the third structure built in 1540. 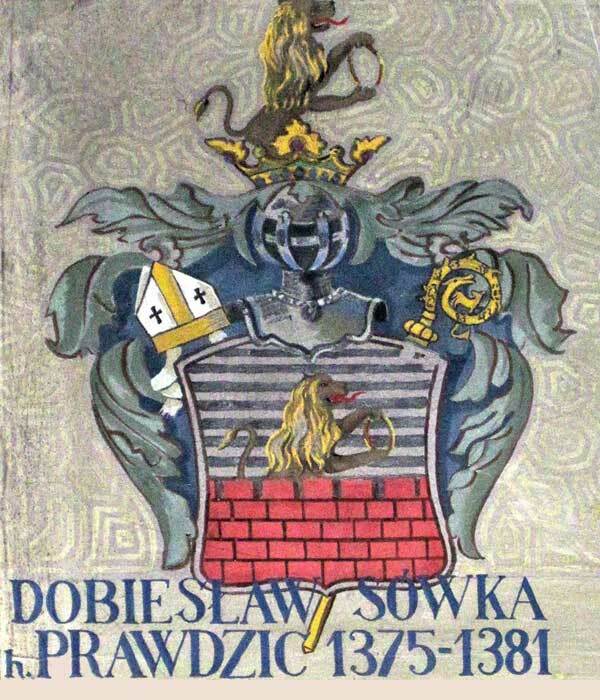 Zaluski writes: “Some had died a natural death, others perished in wars, and others moved to public offices since it is known that in the year 1434 when Wojciech Koziebród was secretary primate, and the signature of Wladyslaw was listed on the protocol election of King Jan Sobieski." Property in the hands of plenipotentiaries also began to decline with the result that there was no money for the maintenance of the actual church. The rest (of the damage) was done by attacks of enemies. The Parish of Koziebrody declined further. Sometimes, only the local peasants kept bringing a monk, who would celebrated the Holy Mass. The church would have completely collapsed, if it were not for Father Jan Zdziarski who arrived in 1540. With the foundation document in hand, he went to Bishop James Buczacki, asking that the fullrights of the Church of the Koziebrodzki be restored. The bishop having read the document, issued, in writing, an edict to restart the parish and to "decorate it as you please." Since then, without interruption, the Church of Koziebrody has had full parochial rights. accusing of witchcraft and murder the peasant woman Catherine of Mala Wies, near Koziebródy. She was also burned at the stake at Raciąż. But in the late sixteenth century, during the already triumphant counter-reformation, even in the most remote rural parish nursery, elementary teaching of reading and writing was initiated and carried out only in Latin. 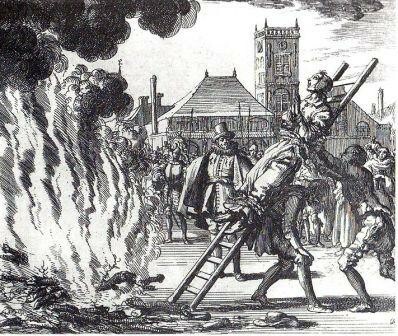 Later however; war, epidemics, superstitions, the belief in devils, ghosts and witchcraft, exorcisms, and the subsequent burning of witches buoyed and contributed to lower educational status. Noteworthy in the seventeenth century, and in many cases discussed in the courts, was the burning of witches. For example, the court at Raciąz (that included the Wojciech Niewieściński manorial farm tenant, Thomas Dumański, Commissioner General and Magistrate of Raciąż) issued a death sentence for Anna Ćwierciaczkę, seeded by accusations of witchcraft. Following numerous tortures, she was burnt in 1719. During the process, she confessed that "the witch Marianna, burned at the stake in Sieraków, had taught her spells and furnished in an ointment, after ingestion of which Satan enters a man.” A few years later, on the 16th of June, 1724, before a court at Raciąż, the Magistrate testified again, accusing of witchcraft and murder the peasant woman Catherine of Mala Wies, near Koziebródy. She was also burned at the stake at Raciąż. Increasingly, there were trials for witchcraft, on the one hand, and consequently intensified exploitation of the peasants and townspeople. Rich nobles were not interested in the education of the peasants, and even the poor nobility did not really have the opportunity to learn. Thus, parochial schools were the only reliable source of education available to the peasant children. A book from 1888 recorded the following incidents from the 1780s regarding mysterious lights in the church at night: "This book is the latest news of the parish church in the village of Koziebrody (near Mława). The village has cultivated land of rye for some a food source, and coniferous forests are some places flooded muddy. The wooden church (S. James, and saint Dorothy), and the parish were created in the year 1373; and repaired in the year 1722. The high altar painting of the Virgin Mary of Czestochowa N., graces many providing, in this painting is a silver dress along with two crowns of silver, several strings of pearls, etc. The picture is draped namely curtain with scarves (made from silver gauze), the drawn blinds is the image of Our Lady of the Rosary. On the altar there are votive offerings of silver and gold (in the shape of hearts, legs, hands, crosses, cups, crowns, etc., and there is also a votive offering of embroidered swaddling clothes). In the church records covering Koziebrody, there are briefs, and other local evidence, located in a notebook with several sheets of paper on which are written statements of various people that have sustained good graces (relief) from the diseases suffered from disabilities and various traumas of life, from going to visit the image of Our Lady of the Koziebrody Parish. Moreover, many people "worthy of faith and trust,” have testified as having seen a brightness in the same church appearing at nighttime. And so, in the year 1784, on December 23rd, a great and extraordinary brightness was seen in the same church the first time that day, lasting until January 7th of 1785. In the year 1785, on July 14th, there is a manuscript of the recorded testimony of Count Sierakowski Słońskiego the Castellan, when he came to Koziebrody, he saw in the nighttime between the 11th and 12th hour in the church, before the altar of Our Lady, a great brightness; great as insofar that all the glass in the windows could be counted, this appeared three times and then vanished; he saw also the stars on the ceiling above the altar in the church moving and lasting close to the quarter of an hour. 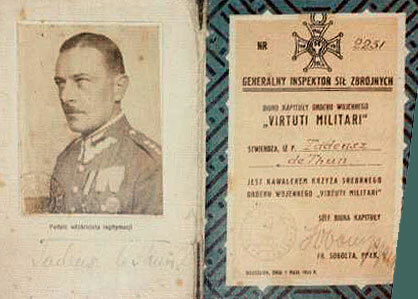 His wife, the Castellans M. Sierakowska, also testified to experiencing a similar vision. In the same year, 1785, on the 12th of August, Sylwester Zielinski, the parish priest in Gralewie (subsequently Canon, and then Dean of Plock at Raciąz) at around 10 at night saw an extraordinary light in the church that lasted over half of a quarter of an hour; besides that he saw stars in the window and then running around on the walls of the church, and then sometimes covering the entire window. On many occasions, in this described manner, the brightness in the church of Koziebrody was seen, and then issued with one testified, among these is the testimony of Father Jan Świątecki from the Seminary of Plock, on August 26, 1785. On the feast of Our Lady, the pious, not only from the area adjacent, but also from about dozen or so miles, and even frequently many gather from Prussia, especially on Christmas and the Assumption of Mary, gather for Pentecost, also people in groups from the nearby parishes, with pastors at the head of their respective churches, come for the indulgences. "Another source testifies: "At the end of the eighteenth century (1785) A special committee examined the strange phenomenon of the appearance of lights in the church at night. The committee was comprised of: Fr. Staniszewski - ch. Collegiate Pułtuski, Fr. Cudniski - gostyniński Dean, Fr. Machowski - missionary, Mr. Szumanski - mathematician. After listening to credible witnesses regarding the strange appearance of lights in the church, the committee went to church the following evening. Suddenly, a light shone (in the church). This phenomenon was repeated many times. It was concluded that this was a reflection from the windows of the houses which were nearby. It was ordered to extinguish all the lights, but the light still appeared in the church." "Mapa topograficzna Królestwa Kongresowego z roku 1839," showing the church structure from 1540. It appears to be facing the main street as it is drawn oriented N-S on the long axis, opposite from the current 1880 structure. A cross with a statue on it is shown on front of the church, just to the left. Click here for an explanation of the map. The 334 year old wooden church built in 1540 was demolished by order of the Russian occupying authorities in 1874. The present church structure dates from 1880 - during the pastorship of Fr. Paweł Kwiatkowski - and was designed by the Polish architect Józef Górski (d.1894). 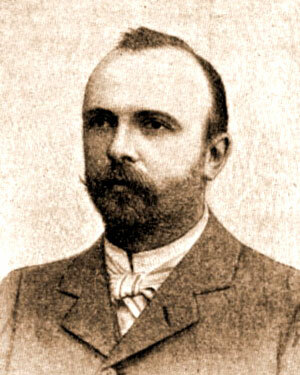 Górski was the principle architect of Gubernya Płocka between 1865 and his death in 1894. He worked on a number of religious structures in the region, including the orthodox churches that appeared in Płock (1863) Rypin (1894), Sierpc (1884), and Wyszyny Kościelne, near Mława (1894, rebuilt by Szyller in 1905). For some unknown reason, the new structure was not consecrated until six years later in 1886 by Bishop Henryk Kossowski. Bishop Kossowski (1828-1903) was an impressive man who spoke six languages. After graduating from university in 1846, he moved to Podolia and for a time and managed a sugar factory on the estate of Prince Sanguszki. In 1852 he went to attend seminary upon the advice of a priest that he met at Podolia, and later he attended the Theological Academy in St. Petersburg. He was ordained in 1857 and in 1863 was appointed the Rector of the Academy in Warsaw. From 1885 until 1890 he was the Vicar of the Chapter of Płock and made titular Suffragan Bishop by Pope Leo XIII. He made significant translations of religious works, including the Holy Scriptures and the writings of St. Teresa. In recognition of his scholarly work, Jagiellonian University in 1900 awarded him an honorary doctorate. Stephan Szyller (b. Sept 4, 1857 in Warsaw , d. 22 June 1933 in Kutno, Poland) was the architect of the expansions of the current structure in 1902 and in 1909. He was educated in St. Petersburg, where in 1881 he graduated from the faculty of architecture of the local Academy of Fine Arts. He started his practice in Warsaw and was one of the architects of the evolving "national style," which drew inspiration from the neo-gothic, renaissance, and classicist movements in architecture. Working primarily in Warsaw, Szyller was the author of about a hundred house projects and numerous churches. He is also designed some theoretical productions and in 1916 published a book entitled Czy mamy polską architekturę? and in 1917 Tradycja budownictwa ludowego w architekturze polskiej. He was an advocate of historical forms, in his own work referring to the Renaissance and Baroque. He repeatedly received architectural awards, including the St. Anna medallion for the building of the Technical University in 1904, and City of Warsaw Artistic Award in 1931. Among his works outside of Warsaw, projects that should be mentioned are the reconstruction of the palace at Marchwacz in 1905, the Neo-Baroque church in Mońki in 1925, the neogothic church in Olbierzowice, and the rebuilding of the Cathedral of Płock. They are also some interesting 18th century silver embellishments to the altars that were restored in 1962. Also restored were the baroque lateral altars that hold two sculptures and 18th century images of St. Michael, the Mother of God, the Crucifixion, and of St. John from the 17th century. In 1973, the Pluciski polychrome was executed as the Church had become a significant place of pilgrimage in the region. Numerous pilgrims arrive to observe the solemnity of September 8th. 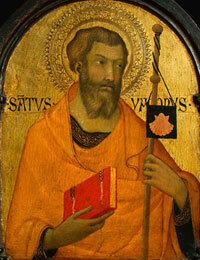 The patron saint of the parish is Saint James the Apostle, who's Feast Day is July 25th, his birthday. September 8th is the Feast of Our Lady Mary at the Church and is also observed with great ceremony in Koziebrody. The Koziebrody Parish is a regional sanctuary know to be deeply devoted to the Virgin Mary; therefore, September 8th is an important holiday in the Parish, marking the birthday of the Virgin Mary. The faithful from the entire Diocese of Płock make an annual pilgrimage to the Church of Saint Jakuba on that date each year. In the parish of Koziebrody at the end of 18th and the beginning of 19th century were at least 3 main branches of the Kuźniewski Family. 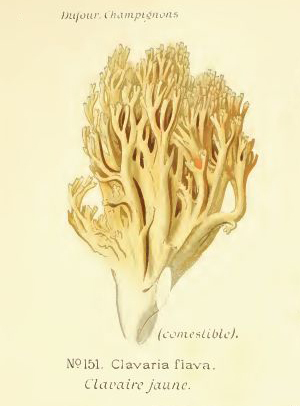 All the branches were related, although the exact connection is not clear. In the 18th century, they were called Kuźniak and at the begining of the 19th century started writing the name as Kuźniewski. One of the branches lived in the village of Milewo (Błażej Kuzniewski, b.1787, belonged to this branch) and the other one in the village of Milewko. However both of the branches originally came from Milewko. Then, at the beginning of the 19th century, some of the descendants started moving to other villages nearby. E.g. to Chabowo Stara Wieś, Piaski, Cieśle, Kraszewo Czubaki, Budy Kraszewskie, Drobin, etc. (those villages belong not only to parish of Koziebrody, but also to parish of Drobin and Raciąż). This is confirmed by the documents. I investigated certificates of the parish of Zawidz (next to Koziebrody) and found that in the 17th century there was a family called Kuźniak living in this parish. Then, at the beginning of the 18th century, they disappear from the records. So perhaps our Kuźniewski ancestors could first have liven in Zawidz, purchased land in Koziebrody, and moved there. This is just a theory, but seems to be logical (relying on the genealogical experience). See a map of these settlements here. 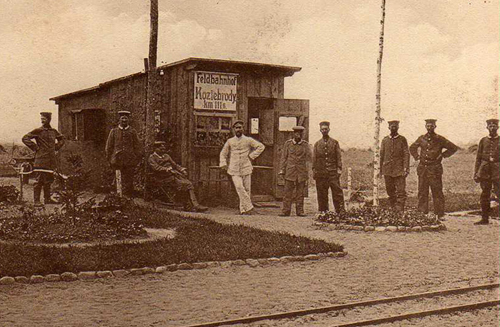 Military outpost in Koziebrody, 1915. 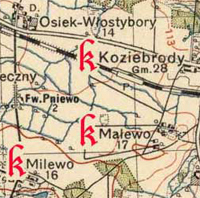 During WWII, Nazi cartographers renamed Koziebrody as "Ziegenbart" (goat beard in German) and Mała Wieś as "Kleindorf" (small village). The present church, where Adam was baptized, is the third or fourth actual religious structure on the site and it has been remodeled many times over the years. One previous version, presumably the one previous to the current structure, was without a steeple and had a flat ceiling over the nave. The Chapel of the Holy Family was expanded several times by the priest Fr. Alexander Kasiskiego, in both 1902 and in 1909. The present presbytery was built in 1925, when there was a priest named Fr. Stanisław Krzywkowski in place who was at the parish from 1921 to 1936. 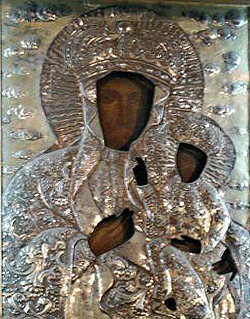 In the church there are five altars; above the main one, which is made of marble, there is a 1938 copy of the celebrated graceful image of the Madonna from Czestochowa painted in 1711. 1598 Parish church Ś. Lawrence (WP 5, 378).